Srinagar, September 11 (Scoop News)- Vikar Rasool Wani, MLA Banihal, met Governor Satya Pal Malik at the Raj Bhavan here today and submitted a memorandum of his demands. Sh. 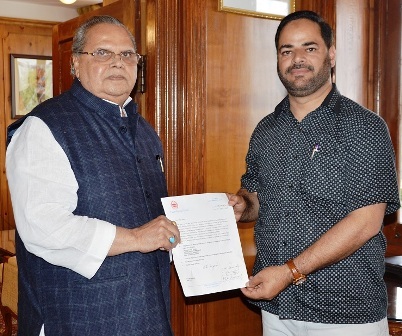 Wani apprised Governor about the development needs of his Constituency and requested Governor that High Schools of Pogal, Chamalwas, Ramsoo, Sumbar be put in the list of 199 schools approved for upgradation, release of funds for improvement of Chamalwas - Neel Road, sanctioning a Sports Stadium at Lambar, and a Degree College at Ukarhall. He also requested Governor for early resolution of grievances of the SSA teachers.